Find news about various topics affecting Newtown. About two times per month, I send out my Newtown News Update, an e-mail newsletter that keeps subscribers up-to-date on what's going on in Newtown Township and at the Board of Supervisors and other public meetings. The opinions expressed in this newsletter are solely mine and do not represent the views of any other person or entity. Click the "Subscribe" button to sign on and receive this newsletter in your email inbox. You can unsubscribe at any time. To download a printable version of the newsletter: Click the three dots at the lower right side, then click "Share", then click "Email," enter your email address (to and from), Then click "Send." You will receive a PDF file that you can print and save. Subscribe now to be sure to get the next issue delivered FREE to your email inbox! 2019 Roadway Program, PFAS in Newtown Water, Smashed Mailbox Policy, More... (February 17, 2019). Find out what roads will be "rehabilitated" (i.e., repaved) in 2019. Learn about perfluorinated compounds (i.e., PFOS and PFOA Definition) detected in Newtown's water supply. Is Newtown's website and social media presence all that it can be? What's Newtown's policy on reimbursement of expenses to replace mailboxes destroyed by a Newtown/Contractor plow truck? Access the entire issue here. How Does Newtown Township’s Website Stack Up? Access the entire issue here. Opioid Lawsuit Survey Results and Latest BOS Decisions (January 26, 2019). A review of the results of a survey, which asks Do You Support Newtown's Decision to File a Civil Lawsuit Against Opioid Manufacturers? This is not an official Newtown Township approved survey. Its purpose is solely to inform John Mack – a Newtown Supervisor – of the public’s opinion regarding this issue. Also includes a summary of the January 23, 2019, Board of Supervisors meeting. Access the entire issue here. Arcadia Green Three Peat: Sues Newtown Again! While We Ring in the New Year, Let's Celebrate What was Accomplished in 2018! (January 1, 2019). Articles include: (1) Notable Accomplishments in 2018, (2) Newtown Sues Opioid Manufacturers! Survey: Test your knowledge of statistics regarding opioids and the opioid epidemic, then answer the question: Do You Support Newtown's Decision to File a Civil Lawsuit Against Opioid Manufacturers? (3) The 2018 Fire and Emergency Services Study. Access the entire issue here. I write about and comment upon decisions made at Board of Supervisors and other public meetings, including Zoning Hearing Board and Advisory Committee meetings. Often articles talk about issues before they are published in the official minutes of meetings. Many articles incude links to short videos of select discussions. I often host surveys whenever an important issue comes before the Board of Supervisors, sometimes even before the issue is discussed by the Board. This gives subscribers an opportunity to voice their opinion anonymously about issues. The results are published in the newsletter and shared with the Board of Supervisors and the general public. My blog focuses on a range of topics such as water quality, preservation of open space, opioid epidemic, etc. The newsletter provides more in-depth versions of blog posts and includes information that was not available at the time the posts were written. 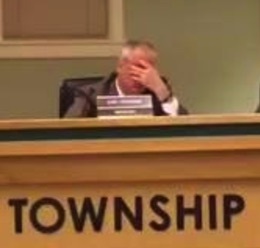 This keeps subscribers up to date on important issues affecting Newtown Township.